Amid the stately monuments and gently rolling hills of emerald green, there works a tiny black man, diligently grooming the resting places of many of his lifelong friends and neighbours. It is only 8 a.m. Heavy beads of dew cling to the leaves and blades of grass, the sun squints through the early morning mist and flickers off the chain holding a gold pocketwatch prominently displayed from his belt loop and already Harry Hill is hard at work tending Bear River�s beautiful Mount Hope Cemetery. Harry Hill was the caretaker of the cemetery from 1956 to 1994. Harry Hill took a special pride in his job. 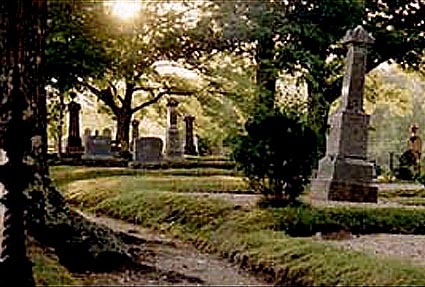 He did all of the tending and maintenance work including the difficult mowing of the hilly grounds, the upkeep of the lots, trimming and grooming foliage and the digging of graves. He said many people noted Mount Hope Cemetery as one of the most beautiful and best kept cemeteries in Nova Scotia. He was 80 years old when he retired. Harry was born into a family of sixteen children in Bear River, N.S. on May 14, 1913. His ancestors came to Nova Scotia as Black Loyalists and received large land grants in the Bear River area. At a diminutive five feet, one inch tall, Harry bustles around with great agility and energy. He still claims he is in excellent health although he suffered from rickets as a small boy and underwent rigorous therapy to enable him to walk. Harry left school after grad 10 and worked for the J.H. Cunningham Stave Mill in Bear River for the next 26 years in numerous capacities as a labourer and night watchman. He also worked as a bricklayer for a year and a half and was the janitor at the Bear River Post Office for 13 years during the same time period that he was caretaker for Mount Hope Cemetery. As well as the great care and pride in his work, Harry has done much in service of his community, particularly in the interests of its young people. For 18 years he ran an outdoor skating rink behind the Bear River Firehall and he is credited with teaching many of the young people of that time how to skate. He also coached a girl�s softball team for 12 years. A colourful local character, Harry often acts as Bear River�s Ambassador of Good Will, to the many tourists and visitors to the area, representing the village proudly. Harry is regarded by the community with much fondness and respect. Harry can be seen during festive occasions, such as Bear River Cherry Carnival, always resplendently dressed, directing traffic or chatting with the tourists. He may often be found around the village offering his advice and opinions on a number of varied topics of expertise. He is a champion of human rights and equality. Harry is so popular with tourists and locals that he even has his own postcard.